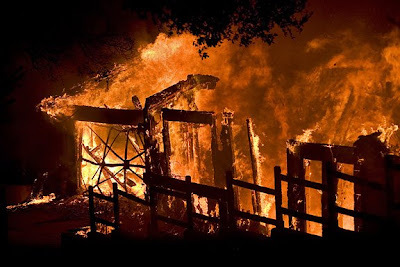 The LA Times is reporting that the Montecito "Tea Fire" was started by ten teen agers, on top of a hill and abandoned Montecito party spot called the "Tea House", trying to keep warm then leaving the bonfire they set to burn out. The fire's embers continued to burn for 12 hours, then were carried by the notorious "sundowner" winds of Santa Barbara. The fire destroyed over 250 luxury homes and injured 25 people. The Santa Barbara D.A. 's office has not charged the teens yet. The teens are local students from an unidentified school. Westmont College, a Christian College, is down the street from where the fire began. The teens have been reported to be cooperative and did not intend to start the fire according to the LA Times and Santa Barbara D.A. 's office. Yorba Linda "Freeway Complex Fire"